Victoria Chinatown Lioness volunteered at the first Woman2 Warrior event held at West Shore Parks and Recreation. 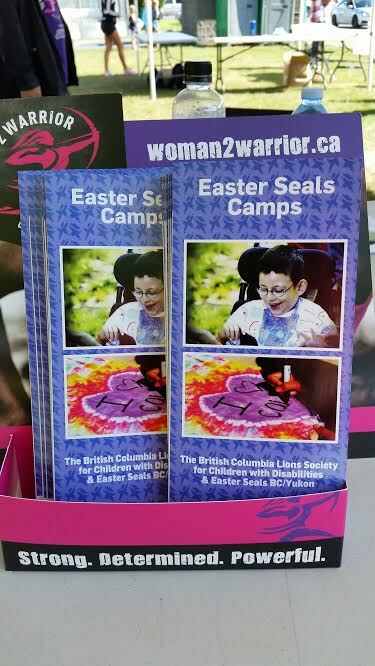 More than $50,000 was raised for Easter Seals camps in B.C. including Camp Shawnigan. Lioness assisted over 175 woman from across the island to register for the event. Lioness Gayle, Susanne, Annette, Ellen and Pei Mei with BC Lions Society Director Stephen Miller from Vancouver and past Lioness member Eileen . Lioness event chair Pei Mei reports: This is just before the craziness began! Lioness were assigned registration and gear/bag check duties. There was quite the buzz in the air and it was exciting being in the midst of it all! The weather was great and it was perfect conditions for getting through the course. There were smiles and laughter everywhere! Some participants even did some of the obstacles more than once and help was given to teammates when needed. Some of the outfits were extremely creative! Lioness event chair Pei Mei enthusiastically adds that We look forward to helping out again next year! Plans are already in the works for a Lioness team, team name, and team outfit so we can join in the fun and raise $$ for the kids! It really is a very fun and worthwhile event! This entry was posted in COMMUNITY SERVICE and tagged BC Lions Club, Camp Shawnigan, community support, Easter Seals, Lioness, Shannon Bernays, Victoria Chinatown Lioness Club, W2W, Wesrt Shore Parks and Recreation, Woman2Warrior. Bookmark the permalink.